The Autosomal Me – Who Am I? This is Part 3 of a multi-part series. Part 1 was “The Autosomal Me – Unraveling Minority Admixture” and Part 2 was “The Autosomal Me – The Ancestors Speak.” Part 1 discussed the technique we are going to use to unravel minority ancestry, and why it works. Part two gave an example of the power of fragmented chromosomal mapping and the beauty of the results. This series focuses on answering the questions of identity through autosomal testing, in particular, for minority ancestry. By minority, I mean any small, elusive amount of any type of ancestry you are seeking to discover in your heritage. In my case, that’s both Native American and African. This segment, Part 3, focuses on using pedigree charts to gauge expected results, how autosomal ethnic groups are determined and how fragmented minority admixture mapping is different from other techniques. This leads us into Part 4 which shows the various results from different testing companies and how they differ. Part 5 features third party analysis tools and Part 6 begins the analyses of the data that parts 3, 4 and 5 provide. Let’s hope that with all of this information, we can answer at least part of the question: Who am I? I was reminded on Christmas day, that I still don’t have the answer to that question. On Christmas afternoon, our family saw Les Miz, again. Nothing reduces me to tears as quickly. In Les Miz, Jean ValJean certainly knew who he was……24601. His assurance of who he was reminded me that I still don’t’ know. Who am I really? I don’t have the conviction that Colm Wilkinson sings with. And let’s face it, I don’t have his voice either, but I still want to answer that burning question. Surely there must be better tools today. I resolved to reevaluate what we can do with current technology and tools. Hence, this series. A lot of who I am has to do with who my ancestors were, where they lived, what they did, choices they made. Did they fight in the American or French Revolution? On which side? Were they Native? Were they African? Were they slaves? So, who were they? One of the reasons I began with genetic genealogy more than a decade ago was to confirm or disprove the persistent family history of Native American heritage that I had been unable to resolve using only traditional genealogy tools. I have made inroads with that, in unexpected ways and places, because of and in addition to genetic genealogy. Genetic genealogy and traditional genealogy go hand in hand. It’s difficult tracking down each line to perform mitochondrial or Yline DNA tests. Sometimes, it’s beyond difficult and it’s impossible. Lines die out, people refuse to test or you simply can’t find the right people. We need other tools. Enter autosomal genetics. From the beginning, early in genetic genealogy, we had the CODIS type forensic and paternity type tests. I reviewed the results of those early tests relative to my pedigree chart in a paper I wrote, “Revealing American Indian and Minority Heritage UsingY-line, Mitochondrial, Autosomal and X-ChromosomalTesting Data Combined with Pedigree Analysis,” published in JoGG in the Fall 2010 Issue. We’ve come a long way since then. In that article, I dissected my pedigree chart to determine how much of different types of ancestry I carried and how that compared with the testing that had been performed at that time. (1) The ethnic heritage of several lines could probably be inferred by surname or ethnicity of marriage partner. However, I have avoided the temptation to make inferences within the United States, as the Native or African ancestry may well lie with one of these ancestors. These are in fact the perfect candidates and to eliminate them from consideration by inferring origins would be a disservice. This is a useful exercize, not just for minority admixture, but to help evaluate the results you receive from the various testing companies. For example, you might notice that there is no Scandinavian showing in my pedigree chart, which makes Ancestry’s 80% British and 12% Scandinavian suspect right off the bat. It also makes results as high as 25% Native American reported in one of the earlier tests impossible. This pedigree analysis tool helps you understand what is reasonable to expect in terms of ethnicity breakdown. Now that we know what the majority ancestry looks like and any minority ancestry that we are aware of, let’s take a look at the various types of autosomal testing available. In the paper, I reviewed the older results from companies using either CODIS or proprietary markers. These low resolution tests are out of date now (although many are still being sold) and have been replaced by the much more thorough wide spectrum tests using chip based technology, allowing hundreds of thousands of DNA locations to be tested and evaluated. Of course, the word evaluated is the loose cannon in that sentence, because the quality of the evaluation is key here. And the evaluation is dependent upon accurate and widespread data bases to compare DNA results against to determine which populations have higher and lower frequencies of specific alleles (markers) occurring in their populations. For example, let’s compare a population in Siberia that shows 100% of a specific marker value, let’s say a value of 10 at marker location ZZZ. Now let’s compare that result to a population from Africa at that same marker location, but with a value never found in Siberia, let’s say a value of 7. Each of thousands of markers are evaluated this way, creating patterns. Now, you have a tester who doesn’t know where their ancestors are from, whose results at marker location ZZZ have a value of 10. Would you say they are more likely to have ancestry in Siberia or Africa? This participant’s marker results for ZZZ go in the “very strongly Siberia” bucket. Of course, other markers they carry might indicate Africa, or Europe, or elsewhere, because we are a Heinz 57 mix of all of our ancestors. 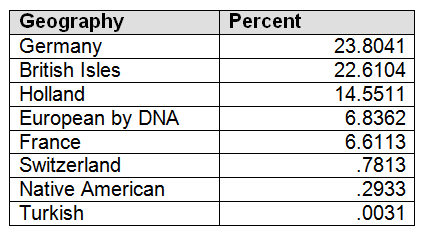 But this is, in essence, how our ethnicity is determined by autosomal DNA testing. Needless to say, you can be a lot more accurate with thousands of markers than with the 15 or 21 CODIS markers, or even the 300+ in some of the proprietary tests. Using autosomal results to determine ethnicity is called BGA testing, or Biogeographical Ancestry testing. It has been used for years to determine percentages of ethnicity. So, how is what I’m doing different and what makes it unique and new to genetic genealogy? 1. Traditional BGA testing deals in percentages of ethnicity, meaning generally 1% or more. Small amounts are difficult to track in the best of circumstances. When dealing with small amounts of admixture, not all tests will be able to identify the minority ethnicity in question. We’re using these tests, plus additional BGA chromosomal painting tools combined with some spreadsheet comparison techniques to cross that 1% threshold. 2. The prevailing winds in this industry have been that anything smaller than 1% was undetectable, and that any amount of admixture less than 7cM, 5cM or 3.5cM (depending on the source) was usless. While this is relatively accurate (but not always) when determining a genealogical relationship within the past few generations, it’s not true when looking beyond the accepted 6 to 7 generation threshold where the 1% ethnicity issue comes into play. At that point, we know we can’t identify the minority ancestor genealogically, so we have to identify them by their membership in a minority population group. I am using a variety of tools and techniques to reach across that threshold. 3. Instead of using these various tools to try to establish a genealogical relationship with another tester (such as we share a common great-grandfather), I am using these tools to attempt to identify which line or lines carry minority admixture. If you already know who in your family tree contributes that admixture, you don’t need this technique. If you are looking to confirm minority admixture below 1%, searching for the minority admixture contributing line, or trying to figure out which of your known ancestors contributed minority admixture, then this technique is for you. Typically these tools have been used to track segments from known ancestors, like a Jewish grandmother, for example. These segments are large and evident. That’s not the case with small amounts of minority admixture. Using several BGA tools together helps to eliminate the possibility of one tool picking up on these small segments and another one missing it. We are bringing all of the resources from various camps together to bear on the situation. This is the ultimate form of recycling, using the shreds that were left on the cutting room floor and deemed to be usless when in actuality, they are diamonds in the rough. We’re reassembling them and looking at them from a different perspective. It’s a new kind of quilting! As I’ve worked through this process, it seems that Minority Admixture Mapping best suits what we are doing, so MAP it is. It makes sense and you can say it. 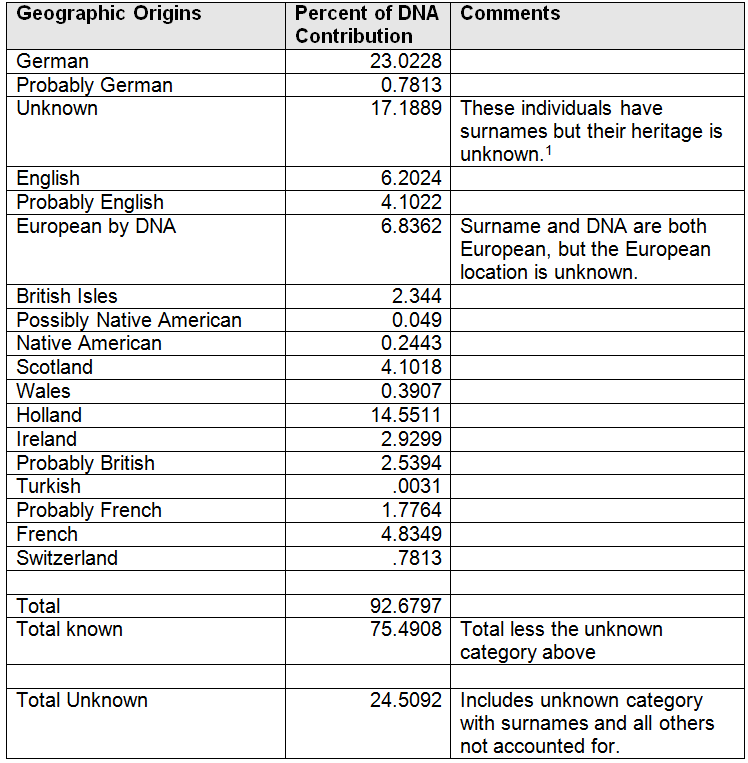 I still want to know who I am, so in Part 4, we begin our data analysis by looking at the autosomal ethnicity results of the various testing companies and how they compare. This entry was posted in Admixture, Autosomal, Ethnicity, Native American and tagged autosomalme, Intermediate DNA by Roberta Estes. Bookmark the permalink. With respect to the Scandinavian heritage mentioned in your article, are you forgetting that several places in the British Isles were once settled by Vikings? The Danelaw on the east coast was entirely settled at one time by Scandinavians. Isn’t that where any Scandinavian DNA may have come from? Well, that’s a good question, but the answer is no. Think about this. 12% is equal to one great-grandparent. Look at my chart, which is why I posted it. I have zero Scandinavian, a lot of German – 23% that is missed entirely, British, 22% which is accounted for, except way too high, 14% Dutch and I’m not sure where they would classify that. Some very small amount of Scandinavian, IF they had also found my majority ancestry of German, I would buy, but not under the current circumstances and not at 12%. The point of doing one of these charts is so that you can look at results and determine if they are realistic or not. These aren’t. I sent an email to ftDNA requesting information on ” consulting the full list for the East Asia Continental groups and the sub-continental groups” as recommended on their Population finder FAQs. I haven’t received a reply from them and perhaps I never will as I was told (when I tried to include my Family Finder kit #) that there was no such kit # in their system. Can you tell me where I can find the information I am looking for? That’s odd. Maybe a typo in the kit number? Sign on to your personal page and check. In any case, usually in the FAQ there are hotlinks to things like that. If you can provide the link to the exact verbiage in the FAQ, I might be able to figure it out. They really are the ones who need to respond though, as I don’t know. Thank you very much for your informative blog! It has inspired me to finally test myself and parents. I received them today from 23 & Me and just registered my test… but one question. The part where we enter our family tree seems to be asking for current or latest last names. There is a space for the birth last name, the married or changed name is what appears on the tree. On all the family trees I have ever constructed, I always used maiden names. I see how married names could be useful for identifying women who are still living, but most on the tree are deceased and it seems to me that maiden names would be more useful for research. Which is the proper way to enter the information? Thanks again. When I ordered my kit from 23andMe they didn’t ask those questions, so I’m not familiar with the exact sequence you’re describing. I always enter maiden names in situations like this. Can you help me understand some basics about these tables used by gedmatch? Single Population sharing (source) and off to the side it says distance? What does the distance represent? Is it how many generations removed from the origingal? does the lower the number under distance mean my DNA is more of this group then one with a higher distance number? 2. What about mixed mode pop sharing? Example at position 19 mine list 66% Brong (Henn) and across from Brong is listed 34% N. European (XING)? Does this mean at my chromosome number 19 I have Brong DNA and N. European? Some of the charts list three admixtures and some list four admixtures. do I read them the same whether they are single or multiple admixtures? I know this is simple for you but it’s pretty confusing for me. Please Help me understand! You’ll need to contact the author of the software for specific questions about how to interpret their output. They change things from version to version. I think the fact is if you’re Western European particularly from the British Isles or your ancestors were from Germany or France that’s about as good as it gets. There are been constant migrations back and forth since the last Ice Age broke up even Julius Caesar couldn’t decipher the difference between a Celtic tribe a Gallic tribe and a Germanic tribe sometimes.. Like you I have a very well-defined genealogy chart going back in many cases to the 16th century or earlier. My grandmother was from Northern Ireland and not parts pretty easy to trace. Most of my family lines have been in America since colonial times. If we go by both family names and documents of immigration etc. my ancestors were about 75% from northern England, Scotland, and about 10% from Ireland. The other 15, are Swiss and French. Of course Ancestry has me down is 20 some percent Scandinavian which is probably really ancient ancestors from Jutland, Denmark etc. When you realize that many of the ancient remains their finding in England came from the continent tells you a lot. There is also the laughable situation where I have a paternal first cousin and a maternal first cousin,neither one of which shows even a remote amount of Scandinavian in their ancestry? My favorite glitch from Ancestry.com is a brother and sister one of which is 88% European and the other 100%.